A slightly swanky inner-city bar that is both versatile and inviting. For the first time in 100 years, the CBD and Northbridge are connected, thanks to the recently finished Perth City Link and this stylish new bar. 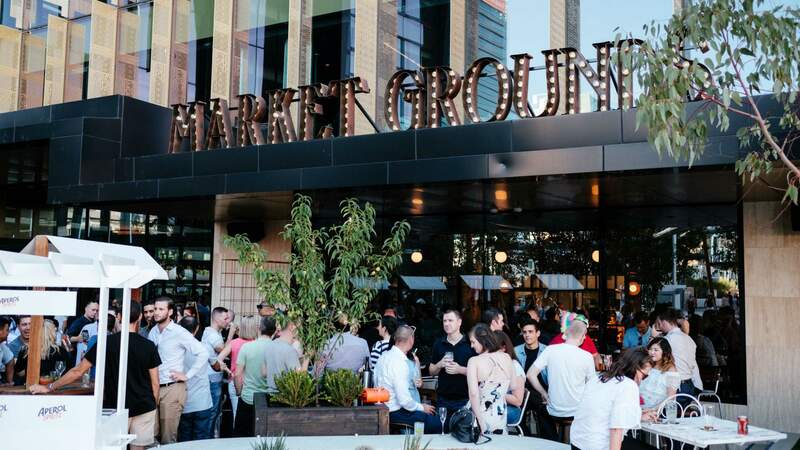 Located in Kings Square in what used to be a marketplace, Market Grounds is an upmarket, multilevel establishment with an enviable beer garden out front. Blue-and-white rattan seating, greenery and plenty of natural light are what you'll find when you enter — and this aesthetic extends throughout. You'll want something light and bubbly to go with your airy surrounds and, thankfully, the drinks menu boasts spritzes and fruity cocktails aplenty. Pair your fizz-filled beverage with something from the street-food-inspired bar menu. Items from the Market Bites section, like steamed bao buns ($16) and sashimi ($29) will keep things light, while dishes from the Two Hands list, such as a chip butty ($14) or cheeseburger ($21), are more substantial. Grab a seat in the sun-drenched beer garden and while away the day.